WASHINGTON — Rep. Mark Takano (D-Riverside) on May 22 honored Harvey Milk on the House floor by entering Milk’s most famous words into the Congressional Record. Milk, who served on the San Francisco Board of Supervisors, was the first openly gay person to be elected to public office in California and is considered one of the earliest LGBT activists. He was assassinated in 1978 along with Mayor George Moscone. Takano is the first openly gay person of color elected to Congress. When he first ran for Congress in the 1990s, his opponent attacked him for being gay, but in last year’s election Takano’s sexual orientation wasn’t an issue. Following is the text of Takano’s statement. “Somewhere in Des Moines or San Antonio there is a young gay person who all the sudden realizes that he or she is gay; knows that if their parents find out they will be tossed out of the house, their classmates will taunt the child, and the Anita Bryants and John Briggs are doing their part on TV. And that child has several options: staying in the closet, and suicide. “And you’ve got to elect gay people, so that thousands upon thousands like that child know that there is hope for a better world; there is hope for a better tomorrow. 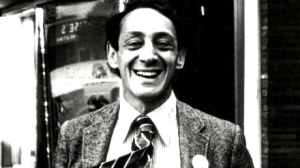 Those words, Mr. Speaker, were spoken by Harvey Milk. It is with tremendous honor and gratitude that I enter them into the Congressional Record on his behalf and all of the us’s in our nation.